What we have, then, are a series of scenes—four, to be exact—in which an unstoppable killer goes after his quarry. There’s nothing wrong with this, and if the resulting sequences were genuinely scary, the episode wouldn’t need to work so hard to justify its existence. Yet none of it is particularly memorable or frightening. As I watched it, I was struck by the extent to which the bar has been raised for this kind of televised suspense, particularly in shows like Breaking Bad and Fargo, which expertly blend the comedic and the terrifying. Fargo isn’t even billed as a suspense show, but it has given us scenes and whole episodes over the last two seasons that built the pressure so expertly that they were almost painful to watch: I’ve rarely had a show keep me in a state of dread for so long. And this doesn’t require graphic violence, or even any violence at all. Despite its title, Fargo takes its most important stylistic cue from another Coen brothers movie entirely, and particularly from the sequence in No Country For Old Men in which Llewelyn Moss awaits Anton Chigurh in his motel room. It’s the most brilliantly sustained sequence of tension in recent memory, and it’s built from little more than our knowledge of the two characters, the physical layout of the space, and a shadow under the door. Fargo has given us a version of this scene in every season, and it does it so well that it makes it all the less forgivable when an episode like “Home Again” falls short. And the funny thing, of course, is that both Fargo and Breaking Bad lie in a direct line of descent from The X-Files. Breaking Bad, obviously, is the handiwork of Vince Gilligan, who learned much of what he knows in his stint on the earlier show, and who revealed himself in “Pusher” to be a master of constructing a tight suspense sequence from a handful of well-chosen elements. And Fargo constantly winks at The X-Files, most notably in the spaceship that darted in and out of sight during the second season, but also in its range and juxtaposition of tones and its sense of stoicism in the face of an incomprehensible universe. If an episode like “Home Again” starts to look a little lame, it’s only because the show’s descendants have done such a good job of expanding upon the basic set of tools that the original series provided. (It also points to a flaw in the show’s decision to allow all the writers to direct their own episodes. It’s a nice gesture, but it also makes me wonder how an episode like this would have played in the hands of a director like, say, Michelle McLaren, who is an expert at extending tension to the breaking point.) Not every Monster of the Week needs to be a masterpiece, but when we’re talking about six episodes after so many years, there’s greater pressure on each installment to give us something special—aside from killing off another member of the Scully family. Because if the show were just a little smarter about dispatching its other victims, it might have decided to let Margaret Scully live. Characterization proceeds by the dossier method often used by C.P. Snow, with similar results—told much but shown little, we get career profiles, some odd habits, earnest details. The narrative comes to a stop while an expository lump cajols us into finding this person interesting. These “expository lumps” are such a hallmark of bad fiction that I’ve basically excluded anything like them from my own work, sometimes to a fault. Readers of my early drafts often comment that they’d like more background on the characters, and they can’t all be wrong. As a result, I’ve gingerly experimented with introducing more backstory, usually in the form of a flashback at a point in the novel where it won’t break the narrative momentum. Backstory, I’ve found, isn’t the enemy: the problem is its tendency to draw the story off into tangents, when most novels really ought to proceed along an uninterrupted narrative line. But there are times when some additional motivation, rooted in a character’s past, can enrich the story and give actions in the present greater resonance. The test is whether what happened then enhances our understanding and appreciation of what is happening now. If the answer is no, it can safely be cut; if yes, it can be retained, but only in as unobtrusive a way as possible. 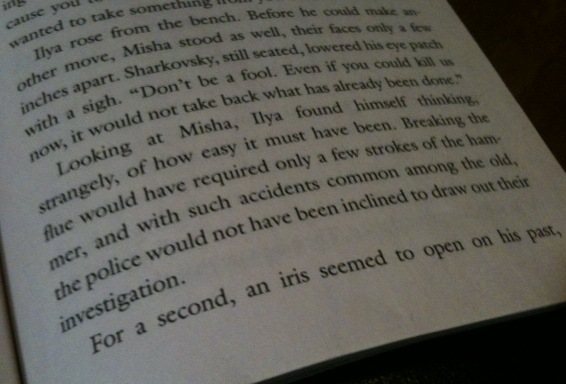 The most significant piece of backstory in The Icon Thief is the death of Ilya Severin’s parents. This was an element that I added fairly late in the process, after I’d already written the first draft, and to be honest, I have mixed feelings about it. 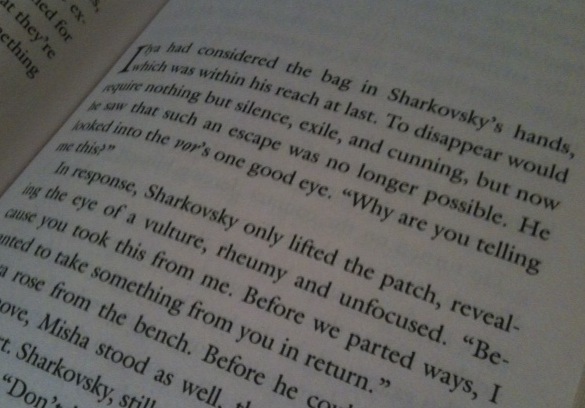 I introduced this detail because Ilya’s desire for retribution, in the original draft, was vivid but somewhat abstract: he’d been betrayed by those he trusted, but I wasn’t entirely convinced that he’d value revenge over simple self-preservation. It was while reading another thriller—I think it was Trevanian’s uneven but often excellent Shibumi—that I reflected that a more personal violation might make his behavior more credible. The trouble with killing his parents is that it’s a somewhat familiar trope, which is why I tend to underplay it in the sequels, and once I’d introduced it, I was stuck with it for what turned out to be two more novels. 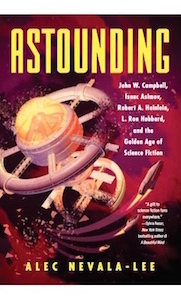 It wasn’t the kind of thing that could just be ignored, and it occasionally caused problems for the stories I wanted to tell, in which Ilya had to appear to come to terms with the men he hated. Alfred Hitchcock’s Psycho is full of unforgettable images, but two of the greatest are often overlooked. The first is that oddly melancholy moment when, from over Janet Leigh’s shoulder, we see the bathroom door open through the translucent shower curtain, the camera silently holding for a few seconds on the silhouette of the figure beyond, before the curtain is drawn aside and all hell breaks loose. The second, from the great staircase scene, is the shot of the door opening at the top of the steps, also in silence, shortly before Martin Balsam’s detective meets his startling end. Neither shot draws attention to itself, but both are utterly essential: for a few agonizing seconds, we know exactly what’s going to happen next, and that sense of dread heightens our terror and horror at what immediately follows. True, bad things happen to my characters. Sometimes terrible things. But I don’t show it to you in living color. I don’t have to. I don’t want to. Because, caught up in dread, you’ll imagine far worse things happening than I could ever think up to show you myself. At their most effective, the tools of dread seem so simple that it’s easy to underestimate the craft required. In Danse Macabre, Stephen King observes that the scariest image in the world is that of a closed door. Very true—but only if the pieces of the story have been properly assembled in advance, so that we’re afraid to find out what might be on the other side. I’ve rarely had as hair-raising an experience at the movies as the first time I saw No Country For Old Men, but its greatest image, like those in Psycho, is one of the simplest: a closed hotel room door, seen from inside, with light visible underneath, which is suddenly blocked off by the shadow of a man in the hallway. Nothing could be simpler—except that film has already established the characters of the men both inside and outside the room, and without that essential groundwork, the tension wouldn’t be nearly as unbearable. And the tools of dread, like all fictional devices, can be misused when taken out of context. Ti West’s ’80s horror pastiche The House of the Devil has a lot of fans, but for all its cleverness, I think it displays a fundamental misunderstanding of the workings of true horror. It repeatedly shows its heroine moving past dark doorways, and each time she does, our heart rate accelerates—but time and again, nothing happens. And after an hour of establishing the layout of this terrifying house, when the horror finally does come, the film commits the ultimate crime: it cuts away to a room we’ve never seen. The mounting sense of dread turns out to be just another tease, even if more skillfully executed than most. Because the ultimate lesson of dread is that, to justify itself, it must turn to terror. The shower curtain draws back. The figure appears on the stairs. And sooner or later, something comes out of that door. I mean, the way the whole thing got started was that I was looking for an idea and reading William Shirer’s The Rise and Fall of the Third Reich. I was following my own advice and reading voraciously and promiscuously when I was looking for an idea. That book had always been on my list of book to read, and I was instantly enthralled…I was looking for characters through whose eyes I can tell that story. At some point, I came across Dodd’s diary and at some point after that, I came across Martha’s memoir…So once I found them, and I got a sense of the interesting characters. Then it was a question of finding as much about them as I could. What I love about this account is that it treats a writer’s search for ideas as an active, focused process that involves wide reading and deep thinking. This may seem obvious, but it’s not the way we tend to think about creative ideas, which sometimes feel like external events that come to us by luck and happenstance. I’m currently reading Julian Jaynes’s The Origin of Consciousness in the Breakdown of the Bicameral Mind, which argues that until around 1200 BC, humans weren’t fully conscious or introspective in the way they are now, but experienced important decisions as auditory hallucinations originating in the right hemisphere of the brain, which were interpreted as the voices of gods or muses. And while the jury is still out on Jaynes’s overall thesis, it strikes me as very similar to how we still think about the origin of creative ideas. Yet the reality is often closer to what Larson describes above, when he says that he “voraciously and promiscuously” sought an idea. And this is as true for novelists as it is for nonfiction writers. The issue is slightly obscured, of course, by the fact that such intellectual voracity is inseparable from a professional writer’s daily routine. But when you look at the origins of great works of fiction, you often find that external inspiration can’t be separated from the deliberate pursuit of ideas. One of the most famous such origin stories, which William Goldman says changed novels and movies forever, was when Peter Benchley was walking along a beach and thought to himself: “What if the shark got territorial?” The idea, apparently, came out of nowhere. But Benchley was already thinking about sharks when the idea came, and spent years researching and developing the idea before he wrote Jaws. Looking for ideas, then, is something like fishing. Clearly there’s a lot of luck involved: even the best fisherman is constrained, to a point, by what happens to swim by. But there are ways in which you can control the circumstances. You select your equipment, pick your location, know how to use your tools, and above all else, know how to react when you feel that first tug on the line. All of these things come with time and experience. Similarly, as a writer, you hone your craft until it becomes intuitive, choose a promising area to start exploring, and learn to recognize a good idea when you see one. (As a writer, you can even use a net instead of a rod and reel, or, in certain situations, dynamite.) Sooner or later, if you’ve done your work properly, you’ll catch something. And sometimes, very occasionally, it might even be a shark. I mean, who says exactly what they’re thinking? What kind of game is that? As much as I enjoyed True Grit, I found myself nostalgic for the old Coens, rather to my own surprise. There was a time, not long ago, when I would have argued that the Coen brothers, for all their craft and intelligence, were the most overrated directors in the world. In particular, I felt that the very qualities that made them so exceptional—their craft, their visual elegance, their astonishing control—made them especially unsuited for comedy, which requires more spontaneity and improvisation than they once seemed willing to allow. And even their best movies, like Fargo, never escaped a faint air of condescension toward their own characters. As a result, with the notable exception of The Hudsucker Proxy, which I’ve always loved, I’ve never found the Coens all that funny—or at least not as funny as their admirers insist. Despite my affection for The Dude, I was never as big a fan of the movie in which he found himself, which reads wonderfully as a script, but never really takes off on the screen. And when the Coens try to work in pure comedic mode—as in The Ladykillers, Intolerable Cruelty, and the inexplicable Burn After Reading (which, I’ll grant, does have its admirers)—I find the results close to unwatchable. In recent years, though, something happened. No Country For Old Men, though it never quite justifies the narrative confusion of its last twenty minutes, is both incredibly tense on the first viewing and hugely amusing thereafter. A Serious Man struck me as close to perfect—their best since Miller’s Crossing, which is still their masterpiece. The Coens, it seemed, had finally relaxed. Their craft, as flawless as ever, had been internalized, instead of storyboarded. Age and success had made them more humane. True Grit feels like the logical culmination of this trend: it’s a movie made, strangely enough, for the audience. That said, though, I hope that their next movie finds the Coens back in their usual mode. (The rumor that they might still adapt The Yiddish Policemen’s Union is very promising.) True Grit is dandy, but it’s a movie that any number of other directors (like Steven Spielberg, its producer) might have made. For most filmmakers, this retreat from eccentricity would be a good thing, but the Coens have earned the right to be prickly and distinctive. With True Grit, they’ve proven their point: they can make a mainstream movie with the best of them. Now it’s time to get back to work.